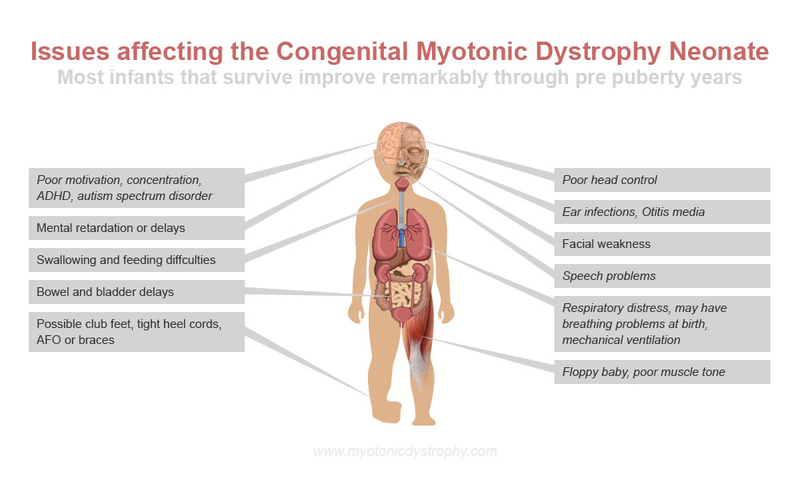 Congenital Myotonic Dystrophy is present at the birth of the Infant. A mother may notice excessive amniotic fluid or polyhydraminos. The mother may also notice less fetal movements than is normal. The baby is born sometimes prematurely. It is a disease that will cause multiple symptoms in the baby. The link to the baby is the mother in almost all cases. For instance, out of 118 cases only 2 cases had any incident that the father was the carrier. However, Paternal transmission (by the father) is documented. (Paternal Transmission of Congenital Myotonic Dystrophy J Med Genet 1994;31518-520) It seems as though the mother somehow causes the disease in the severe form. Some researchers postulate that there does not seem to be a genetic reason for the severe problems that may be caused by the disorder. It may be that the Myotonic Dystrophy in the mother somehow causes the severe congenital form. In Sweden there is identified two types of congenital myotonic dystrophy, severe and moderate. In the severe type there is a life threatening condition at birth. This seems to be associated with male children more than female. With the moderate type of congenital myotonic dystrophy there is no life threatening condition birth. This information is contained in several studies as well as confirmed by by Ekstrom at a recent conference. The severe type will generally have more symptoms and more severe symptoms of the disease. Congential as well as juvenile and adolenscent myotonic dystrophy are hard to diagnosis and identify. Part of the reason for this is that the medical profession does not recongnize this disease as a separate and distinct disease. They symtoms of congenital myotonic dystrophy are separate and distinct from mytonic dystrophy type 1. Thus, its hard for parents to identify the disease that their child may have. For example mental retardation and autism spectrum disorder are not symtoms of myotonic dystrophy. But they are symtoms of the congential or juvenile forms of the disease. Swallowing Disorders: Evaluation and Treatment. By E.R. Johnson, MD. Presented to the Neuromuscular Disease Family Education Conference, October 1996. I am reminded of the story of three individuals, a surgeon, an engineer and a politician, who discussed the importance of their profession in the origin of the world as described in the Book of Genesis. As you know, Eve was formed from the rib of Adam and that required a surgeon. The engineer said ,yes, but before that there was order created out of chaos that required engineers. Then the politician said, And who’s responsible for the chaos? When I first began in medicine thirty-five years ago, there was chaos in the area of neuromuscular disease. My first experience with neuromuscular disease occurred in 1947, I had anterior poliomyelitis. And I still remember the rather marked muscle pain in the quite difficult swallowing which I had. Both my parents and myself rejoiced after about a year because I had appeared to have fully recovered, even though in the remainder of junior high and high school I found I was no star athlete I did reasonably well. Until I was drafted in the US Army after I got out of college and was assigned to take training at the Leadership School at Fort Benning, Georgia. In that particular time in order to eat at the mess hall, and there is a reason they call it mess, you had to do ten pull-ups and I couldn’t do them. That was embarrassing. Not only was it embarrassing but I had to lose weight until they finally allowed me to do pushups. I could do all of those. I still didn’t relate this to any neuromuscular disease or any muscle problems and completed my medical school and had seven and a half years of practice in general medicine in Lawrence, Kansas and then took a residency in Physical Medicine & Rehabilitation. At which point I found out that I had rather marked weakness in my biceps and my gluteus medii. And so, I know some of the problems you have to a very mild degree. It was chaos in terms of understanding neuromuscular disease because when I was in medical school (which was 35 years ago) there was no discussion of neuromuscular disease. We learned nothing. The only thing I could recall of that training was that in my senior year we were called to see a single patient. A patient in a major medical center where you see consultation from all over the state of Kansas. And was shown the patient with amyotrophic lateral sclerosis (ALS) and told you practice medicine for over 40 years, and you may see one of these patients and so we want to know what they are like. I was in practice seven days when the first ALS patient came in newly diagnosed by me. In fact, I had five more in the next seven years of practice . I suddenly realized that neuromuscular disease was far more common than what the medical school would have allowed us know. That’s changed. At the University of California at Davis at present all senior medical students must pass through PM&R as a mandatory class assignment and they all go through a neuromuscular disease clinic and we hope some of them come through with an understanding of some of the aspects of neuromuscular disease that assist in doing the following: taking chaos out of the treatment of neuromuscular disease. It takes the politicians, it takes the physician, it takes the engineer and takes the consumer to accomplish this. And this we’ve learned over many, many years. As you know, 25 years ago physical barriers were absolutely incredible. In fact the new airport which was being built in the early 1970s in Dallas/Fortworth was on its way to construction when one of the social workers from the University of Texas Southwest medical school, looked at the plan and found out that the airport was wheelchair inaccessible. She went to the engineers, architects and builders and said, “You can’t do this.” And they said, “It’s on its way we’re not going to change.” She then went to the politician who was Smith, the Governor of the state of Texas and did get it changed. They stopped all construction until the design was corrected. We now face a bigger problem, I think, in terms of the chaos which may come about unless we do something in regards to neuromuscular disease. And that is the chaos is produced from the development in the entrepreneurial health care delivery system in which managed care blocks access to appropriate intervention, and appropriate kind of specialties. This is my assessment of where we’ve gone in the past 25 years and where we are now. I realize that this morning when people were talking about weight reduction and obesity as a major problem that the particular subject I have may not have much of an interest because I want to talk about dysphagia. “Phagia” meaning ingestion of and “dys” meaning inability to ingest. Because swallowing disorders are an important part of neuromuscular disease and are important in terms of maintenance of nutrition and hydration and prevention of aspiration pneumonia. I would like to discuss with you a little bit some of the things we are doing at the present time in order to define what the problem is. About five or six years ago I asked one funding agency for a small amount of money to study swallowing problems in myotonic muscular dystrophy. In fact, I got back the note, don’t bother, there aren’t any. And yet, two years ago an article published in Europe in the Archives of Physical Medicine and Rehabilitation identified that one third of all myotonic dystrophy patients had swallowing disorders as did one third of limb girdle syndrome patients, and one third of spinal muscular atrophy and 50% of those individuals with polymyositis and dermatomyositis, and 44% with myasthenia gravis, 20% with Duchenne muscular dystrophy, and fortunately for those with facioscapulohumeral, only 6% of those with facioscapulohumeral dystrophy. As a consequence, there are these disorders and we didn’t even know how extensive their problems were. We knew those with ALS had significant problems as they progressed they got more and more difficulty with swallowing, and nutrition and hydration became major problems, even handling secretions became major problems. We also learned that the other kinds of neuromuscular diseases had significant swallowing problems too. In fact we were unaware at that time exactly how large the problem was. Swallowing disorders, or dysphagia, are important problems associated with a variety of neurologic and neuromuscular disorders like brain injuries, myopathies and neuropathies which include many of the diagnoses associated with neuromuscular disease, and head and neck cancer, all have significant problems with simply maintaining hydration and maintaining nutrition without developing aspiration pneumonia. The disorders come in a variety of problems. These particular birds would have a considerable problem with their esophagus. This is the gullet, the tube through which food passes from the mouth down into the digestive organ. And in the human being, we have that same problem. Those individuals with neuromuscular disease do have impairment of esophageal motility. They have problems with slow transverse, or travel, of the food bolus through the esophagus. They could have problems down here at the diaphragm, with hiatal hernias and with reflux. That reflux can not only produce burning pain, difficulty swallowing with further swallowing, but could also involve aspiration pneumonia as we’ll see in a moment. So this is an area that can be viewed and easily by the gastroenterologists and neurology radiologists, and it can be done with standard type of x-rays. That is, we take about four frames per second, and we can see most of the disorders which occur in the esophagus. This is the esophagus here, and in front of that is another important article, and that is the trachea. This is the tube with which you breathe and you can see here is an area which can produce a great amount of difficulty and that is there is an opening in the mouth through which food passes, down the esophagus and we want it to go not into the trachea. If it goes into the trachea it drops into the lung and produces either aspiration pneumonia or death. Here are some of the things can be defined by standard types of gastrointestinal studies, at four per second frames rate. You can see webs which are present in the esophagus which can produce block in swallowing, you can see hiatal hernias, and a wide variety of problems. And these have been known since 1950 because the radiologic studies are reasonably accomplished. However there are other kinds of disorders, and in this case you don’t have problems with the esophagus, we have problems with the area called the pharynx. Before about 1988, if we were to describe this bird with the kinds of information that we had about swallowing, that is if this were a swallowing disorder, all we could say was that this was a funny looking bird, because that’s all we could identify. We had very little quantitative data that would allow us to define what the problems are, at least the disease processes, and what can be done about them. We were really interested in this particular area and not just the esophagus. The problems we had before 1988 was that we did not have the technology available to accomplish the measurements required. They were interested in this area here, this is the oral cavity, you can see the teeth. This is where the food is masticated, chewed up and prepared, the tongue is here. What happens, as we’ll see in a moment, is the tongue thrusts the food down into this area, this is the area of the pharynx, and then hopefully, the food passes down into the esophagus. And here is the area where the trachea is leading to the lung. This little finger of material here is called the epiglottis. It stands up allowing us to breathe. It folds down during the swallow for your protection, so that the food passes in the proper way. This is the bone called the hyoid bone and the thyroid bone and is very important in both moving the food into the stomach and preventing aspiration and pneumonia. The pharynx and esophagus are back here and this is a barium, a swallow evaluation material and it is in the wrong place. It is in the area of the vocal box. Here the vocal, this is the trachea. This person is aspirating material into the airway and it drops down into the lung and can lead to death, aspiration or pneumonia. The purpose of the Dysphagia Center, which we generated in 1988 at the University of California, Davis was to establish an interdisciplinary programs for physicians, speech pathologists, nursing specialists, dietitians and other researchers on patients who present with swallowing disorders. The purpose of the referral was intent to define the nature of the dysphagia, in this case a patient with neuromuscular disease, to determine rehabilitation potential to guide the management of nutrition and swallowing and dysphagia, to prevent the pulmonary complications of previously undiagnosed aspiration and to ensure adequate nutrition. To do this, we had to look at a wide variety of new data in a way which could be measured. And the measurements had to be made at about 60 frames per second, not 4 frames per second. So we couldn’t use standard radiographic technique. We had to use what we call videofluroscopy, taking videotapes of patients swallowing material. We wanted to know something about the physiology of the neural control and although we had a lot of data which we call qualitative, that is we could tell whether this patient may or may not aspirate, we have very little of quantitative nature. And those of you who deal with research of this kind realize there is very little you can do without solvent quantitative data, where we use a wide variety of statistical tests to ensure that what we are measuring is valid, and ensure that what we do as treatment is a valid consequence. And we were concerned about treatment and consequences. And very little was known about neuromuscular disease at that time. We know that swallowing disorders occur within a wide variety of neurologic and neuromuscular problems, with strokes, with problems with brain stem strokes. The area that we were concerned with is the anterior horn cells, which is the final cell which initiates the motor reflex. The axon, the telephone cable that carries the impulse from that motor neuron to the muscle, the neuromuscular junction, where there is a break and a material called acetylcholine has to jump across the gap, a receptor on the muscle side, and then finally the firing of the muscle to produce the action. Here is a schematic description of the event that takes place. We do find with Duchenne muscular dystrophy and other patients that sometimes it’s difficult to chew. Sometimes it’s difficult to prepare the material for its passage into the stomach. The tongue is very important. It is actually the propulsive device through which we begin the initiation of what is called the swallow reflex. Once the tongue initiates that impulse the events that occur are reflexive or automatic, and they are controlled by a complex series of events that take place in the brain stem, as well as the frontal lobes. They both initiate the appropriate reflex and ensure that all the timing involved is correct. This is the tongue, and this is called the hard palate. And it is this that the tongue pushes the bolus of food against in order to propel it down into the area called the pharynx. As we see here, if it doesn’t pass into the esophagus and down to the stomach, it may pass into the trachea the air tube, past the vocal cords down into the lungs. The vocal cords are very important because if you do happen to catch food going down the wrong pipe, as people say, what happens is they can catch the food, close, cough and expel the food that was not supposed to be there, if it is not too great. As you know if you eat steak, and you’re not watching what you’re doing, you can get a chunk of steak down into this area and you can’t cough it out. So, I’ll ask each of you a question. Many of you have family members with a neuromuscular disease. If you saw an individual that suddenly stops talking, obviously was having air hunger or great difficulty in breathing, how many of you know what to do? What is that? Heimlich Maneuver, exactly. Everyone, who has family with neuromuscular disease should know Heimlich Maneuver. It doesn’t matter whether the person is seated in a chair or whether the person is supine. All you have to do is place a fist right below the xyphoid process. And do this. A sharp thrust. What’s happening there is you should be below the level of the bony thorax. Use immediate expulsive force to push the stomach against diaphragm. The diaphragm is up against the lungs, and immediate force can dislodge food caught in the vocal cords and then permits the person to cough it on out. How do you know if you have been successful? They can breathe, and they can talk. Because when there is food lodged here, they can’t talk. So it is very important for all of you to understand the Heimlich maneuver and to be able to perform it fairly well. You don’t have to have neuromuscular disease to aspirate either. King Farouk of Egypt in 1950 died in this way. People who don’t have neuromuscular disease who are talking, or laughing, or not paying attention when they swallow can end up with aspiration. It becomes very important for you if you already have a problem with neuromuscular disease to be sure and concentrate on what you’re doing, and not laughing and talking. I can be swallowing properly when I was fifty years of age, thought I had no further difficulty, but as you age you find sometimes you get what is called post polio syndrome, and even though there is no active degeneration or infection in the anterior horn cells, for some reason the anterior horn cells degenerate. Well, I have to be very careful because it becomes very embarrassing for me if I am eating and I cough and choke and sputter. In fact, there is another aspect of swallowing that is important, it is not only to use it for nutrition and hydration, but it is a very social thing to do. You go to family dinners, you go to dinners with company, and so swallowing has a social function as well as physical function. Well, once we initiate that particular swallow, then the bolus passes on down, and the epiglottis begins to fold down here, so the bolus doesn’t go into the trachea. And then as the bolus carries on down, it passes through into the esophagus. In most people the epiglottis folds, there are a few people where it doesn’t. It doesn’t mean that one will aspirate if it doesn’t fold down, as a matter of fact, sword swallowers learn not to fold down, and to make a straight kind of slot into the esophagus, and they put the blade of the sword into their stomach. And finally, the food passes on through into the esophagus and the stomach. It’s very important in order to accomplish this, that you move this hyoid bone and the trachea upwards. It opens upward and out and opens up this vestibule for the food in order to help propel it further down. What we found is that in most of the muscular disease problems, with the exception of polymyositis, these particular muscles do pretty well. As a matter of fact when we first studied the movement of the hyoid using a special process. We actually used a time motion analyzer which is used in cardiac catheterization labs, we thought that what we would find because of muscle weakness that the hyoid would not move as great a distance in individuals with neuromuscular diseases as other individuals. Actually we found it is the opposite. Actually the hyoid moves a greater distance. This is to compensate for greater weakness in this area. These are the constrictor muscles which further propel food on down through the esophagus. This is really important to us in terms of what do from a therapy point of view because what it used to be thought was what we should concentrate on is trying to get this hyoid to move higher, and we would concentrate exercises to do that. And it turns out that in all neuromuscular disease, with the exception of polymyositis, this moves quite well, and we need to concentrate on other areas to improve swallowing. There’s another subject here which is very important in neuromuscular disease, particularly with certain kinds of diagnoses, oculopharyngeal dystrophy, and also limb girdle syndrome, and certain of the polymyositis acquired muscle disease, and that is this area which is called the upper esophageal sphincter. It is a single muscle, called the cricopharyngeus , and that muscle actually acts as kind of a gatekeeper to the movement of food from the pharynx into the esophagus. And if the gatekeeper doesn’t relax at exactly the right moment you have a block in the passage into the tube. This is an electromyographic signal. An EMG is to put a needle into a muscle and to look at the electrical activity, somewhat like we look at the electrocardiogram , except that we slow the speed down and you can see the activity of the entire muscle. What you will notice is just at the moment when the bolus of food goes through the pharynx the cricopharygeus muscle has to relax. Here are the muscles, the “constrictor” muscles in pharynx that are contracting to move the food down. If these two contract and this muscle doesn’t relax, then obviously we have a big block. Here is a block. You can see it fairly well. It’s like a finger, it’s a barrier, so that the food is blocked, and this is called a cricopharyngeal block. And it’s important because with oculopharyngeal muscular dystrophy, a large number of individuals have that block. If you do have that bar, you can identify that there is a reasonable of constriction in the muscles above, you can go in surgically and simply cut the muscle. It’s called a miotomy, which allows the bolus of food to pass on into the esophagus, even sometimes with the weaker muscles. It’s interesting that in 1989, we had three individuals with limb girdle syndrome who had one of these pharyngeal bars and had great difficulty with swallowing. One of them actually said that it took him one and one half hours to eat lunch, and that he could not eat any kind of steak or solid food. After the cricopharyngeal miotomy, he could eat lunch in fifteen or twenty minutes, and he could eat steak, although we prefer red that he not do so, because we don’t like big chunks of food which often cause difficulties. The other thing we like to do is to have control over what the individual eats. It is well demonstrated that if you get something down in the trachea, this water or solid, you initiate a cough reflex. However it is oil it doesn’t initiate the cough reflex. So if we have individuals who have dysphagia, or difficulty swallowing, we ask they not eat kinds of oils coming from the salad dressing, because if they get these into the trachea they will not initiate the cough response. Here again we can see a big, almost thumb-like projection, like a bar, that some can be resolved by doing a miotomy surgically. What we want to do with our particular study is to do a wide variety of qualitative and quantitative reviews. We tried to find what’s happening swallowing both in normal individuals and in individuals with neuromuscular disorders so we can determine what the significant problems are. We won’t go over these, except we have ways of defining very clearly the time at which the swallow starts, and the time at which the swallow ends. We use the time at which the epiglottis flips back into its normal position as the end. And when we first began doing this, we did sixteen normal patients and did about forty stroke patients. We do this with a special mechanism with which we can digitize information on videotape. In this case it is a flurovideo. This is a timing device down here at the bottom which tells the time in seconds. By a hundredth of a second we define when certain events take place. If you look at the time of swallowing of these patient’s, that if they have less than two seconds of swallowing time, there was no aspiration pneumonia. If it was greater than five seconds, there is a 90% incidence of aspiration pneumonia. So this allowed us in stroke patients to give predictive content to those individuals who might be susceptible to aspiration, and to define treatment plans to prevent those problems. We looked at other things associated with stroke with aspiration, and pneumonia. We have now done 65 neuromuscular disease individuals. This is a fairly large amount of data covering a wide variety of measurements and there are some things which are rather apparent. First is that the impairment in neuromuscular disease doesn’t come from tongue malfunction, or even from malfunction in the upper part of the pharynx. It comes from the constrictive muscles that are present in the pharynx to further project the bolus of food. It also comes from the cricopharyngeal bars. We know for instance in certain disorders, the one that causes major difficulties is polymyositis, and in this case, even the upper part of the pharynx is significantly impaired. These individuals very early will have major problems with swallowing. Those patients who have amyotrophic lateral sclerosis will also have progressive swallowing disorders. We use these methods with these problems to try to define how best to deal with those swallowing problems. How do we deal with them? We try to prevent aspiration pneumonia, sometimes by even not allowing the person to eat. We put in what are called PEGs, or gastrostomy tubes, in order to allow proper hydration, nutrition. But we wouldn’t want to put in gastrostomy unless the swallowing impairment was so great that we are not able to resolve it. So we are gathering a large amount of data, which is currently being analyzed by utilizing the videofluroscopy in order to give us good solid information about how bad the problem is, and what we can do to correct it. When we do these, we don’t just do them for research, we try to assist individuals with swallowing disorders, and the families, with some qualitative kinds of advice. This is one of the dynamic videofluoroscopy swallow study reports that are given once we complete the films and the analyses. We talk about this particular patient had a low bar myasthenia gravis, and was poorly responsive to the medication. Myasthenia gravis is a problem in which there is a blocking antibody in the receptor site on the muscle membrane that acetylcholine stimulates to start the muscle contraction. Recall that we have the axon, and at the end of the axon there is a little space between the nerve end and the muscle membrane. Something has to jump the space and the material that jumps the space is acetylcholine. As the nerve impulse comes down, packets of acetylcholine are released, are taken up by these special receptors which fire the muscle tissue. And those individuals having myasthenia gravis, there is a blocking antibody that blocks some receptors and does not allow the muscle to be stimulated. This is important sometimes and in fact, about two months ago, we had a 17 year old girl who was referred to the swallowing study because she was having trouble swallowing. When we did this study, we had not examined her since we took the referral from her physician. And when we looked at it, it looked like a patient who might have myasthenia gravis. So we asked to examine her and on examining her and taking a patient history, which is very important to understand what a patient can and can’t do, she said, “Yeah, I used to be able to carry two bags of groceries up a flight of stairs, I can’t do that anymore. ” This patient had myasthenia gravis. We look at the problems that are present in terms of oral function, mastication of food, and a function of normal swallowing time. In this case, the patient had a normal swallowing time of 1.13 seconds. We were happy about that because it would mean she was less susceptible to aspiration pneumonia. On the other hand, when we looked at her residue, that is, what was left after the swallow, we found that she had marked residual of food still in the pharynx after the swallow. This helps us a little bit where for instance the cricopharyngeal residue is greater on the right. There are two things we can do for her. We can show her and her family what is important. One is that she can double swallow. That is, don’t take another bite until after you have swallowed and then swallowed again, to clear. The second way we found in our work with stroke patients is you have a bigger amount of residue, or a greater amount of weakness, on one side of the throat than the other, simply turn your head to the side of the weakness, or the residue, and this closes off that area and allows the food to pass in to the other side, which is stronger and in fact, we can give those kinds of recommendations. In this case, there was no aspiration seen and since there was no aspiration there was no cough reflex. Her hyoid and laryngeal displacement was fairly high as we see in neuromuscular disease, and she seemed to be doing other things well. We thought she had the ability to maintain the bolus and the pharynx and reduce oropharyngeal restriction. The hyoid and laryngeal elevation were greater than expected because of compensatory effort, and that has been true of almost all the neuromuscular disease individuals that we have seen, much to our surprise, once we got the quantitative data. And then finally what we do is give a recommendation on this report. One thing we do not know is that is exceedingly important is what the effects of medications are. We really don’t know. There are many kinds of medications which are given for a wide variety of problems. Some of them are acetylcholine inhibitors, there are potent kinds of medication, and as yet we don’t know what the effects on swallowing are. We can use this information in order to test the effects of different kinds of medication. At the time that this patient was seen she had a gastrostomy tube. She had a tube in her stomach which was used for feeding. We wanted to remove that because she had satisfactory progress and we could demonstrate on her swallowing study that she could carry the food satisfactorily. We knew she was having trouble with reflux. She took medications as well as raising the head of the bed, and the wide variety of things that could prevent the reflux, where it could be aspirated. All of us aspirate even if we don’t have neuromuscular disease. In fact, the majority of us in stage 3 or 4 sleep will aspirate. But we don’t develop aspiration pneumonia and that’s because we don’t have very large amounts of and most of don’t have high stomach acidity. If we have high stomach acidity or if we aspirate more than 4/10s of a cubic cm per kilogram of weight, we have a high incidence of aspiration pneumonia. So we were able to take the gastrostromy tube out, we changed the consistency of her food, and we were able to allow her to go back to eat. Now most of us thought it would be harder to swallow solid foods than to swallow liquid and this is not true. Thin liquids are much more difficult to swallow than solids. We can change the consistency on our bolus of food and do that in with the barium that we use and decide how rapidly the patient can resolve swallowing difficulties. Well, anyway, there are some contraindications for swallowing evaluation. I would like to simply make one more statement. I grew up in Kansas. In our senior year in medical school we had to go out to a small town in rural Kansas to learn what medicine was really like. In the town I went to there were two physicians in the entire county. The story that traveled around that particular area, there were not enough people in that community to have a preacher. So they had itinerant pastors that went around each Sunday to see congregations. Apparently, one very bitter winter day when there was a blizzard one of the pastors with one of the smaller churches had found one parishioner by the name of Jim. The pastor said, “OK Jim, it’s a bad day out there. It’s a terrible day. What do you want to do? Do you want to have a service or not?” “Well, pastor, if I had a bunch of cattle out in the field, and I took a load of hay out to feed them and I found one cow, I’d sure feed him.” So this pastor said “That’s great.” So he decided that he would give a two hour sermon on the five points of Calvinism and at the end of that time he said, “OK Jim, what do you think?” Jim said, “Well pastor, if I had a bunch of cattle out in the field and I took a load of hay out to feed and I found one cow, I’d feed it, but I wouldn’t feed it the whole blame load.” There is no way in just a brief time we can identify for you all the aspects of swallowing disorders. But I did want you to know that some of the techniques that are being used to assist those of you who may develop problems with swallowing, and for us to gain more information about what can be accomplished. I get to ask one question. I have become concerned about what I would call the abrupt use of the entrepreneurial capitalism in terms of delivering health care. How many of you truly know what a managed care organization is? How many of you know what capitated management care organization means? I would ask all of you, both consumers and family to learn about it rapidly and now. Because changes are taking place, and it is going to take a coalition of doctors, engineers, politicians and consumers to ensure the disabled population, in particular neuromuscular disease individuals, can get the services they require, to see the physician specialists they need to, and get the durable equipment that they need. Question: The thing that scares me is that our older sister died of aspiration. My brother and my problem is mostly when we are asleep, and the excessive fluid in our throat, and it happened to me last night, it happens to me three or four times a week. When I swallow, when I sleep, the wrong way. That’s what happened to my sister and she died. So I’m thinking that I’m just going to one night swallow like that and then just die. So that bothers me a lot. So what can I do about that? Can I lift my bed up or that type of thing? But when I’m asleep, I don’t know what I can do, about the saliva. Answer: The saliva is not going to cause you to die. The saliva, if you have bad gum disease, you want to make sure your gums stay in good condition, see your dentist, get dental appointments. The problem there is if you aspirate, the saliva with bacteria in it, you can develop pneumonia and abscesses from that. So good dental hygiene. Second thing is, do elevate the head in the bed about six inches. I did say you’re absolutely correct. All of us aspirate in deep states 3 and 4 of REM sleep. But we don’t develop aspiration pneumonia and die. Why? Because one is that we have less of the 4/10ths of the cc per kilogram, if it’s a average 70kg weight man, that is not even 28ccs. You don’t aspirate any more than that. So don’t have a heavy meal before you go to bed at night. Have your meal earlier in the evening at 5 or 6, so that its fairly well through the stomach when you begin to digest. Stay away from eating things like peanuts and nuts or meat that’s not well chewed or grounded. Because if you get a chunk of it stuck and you happen to reflux, you may have aspiration. The other thing is if you have any propensity to have acid stomach take an antacid or one of the H2 blockers, cimetidine, etc., to keep the acidity of the stomach relatively high or alkaline because once the acidity drops to a 2.7 pH, you increase your incidence of aspiration pneumonia, not of aspiration and death. Those are some of the things that can help. What can also help is to take a look at the videofluroscopy and see how bad the problem is. It might be that the problem is so bad that you might want to alter how you get your nutrition. I think that you follow this advice and you really reduce your risk of aspiration to a death to a very low level. Be sure when you’re swallowing and eating, you need to pay attention. We all need to. Question: Well, I have pneumonia about three or four times a year, and I’m concerned about getting choked off of saliva. Answer: I don’t think you would choke off of saliva. You’re going to choke off of food. Another thing is if you have pneumonia three or four times a year, you need a dynamic swallow study. One of the indications is to have more than two episodes of pneumonia. It may be because you’re aspirating food. Not necessarily, but maybe. Good question. Yes. Question: You talked about choking after eating how that can be from pooling of food that doesn’t go down. I do that quite often if I try to talk while I’m eating and I’m not very careful. Exactly what is pooling of food? Answer: There are two areas where there are kind of spaces. One is right around the epiglottis, what I talked about earlier… They’re little spaces there and if you don’t have the muscle power to move the food beyond, and it’s right there near the tracheal opening, and the second is below that and it has sinuses, or spaces, that will kind of fill with food, if you have muscle weakness, that’s where it pools. If you take a look at the swallow study you’ll see that there is barium left that should not be there. You could help that by making sure you double swallow. If you do swallow quickly, if you have propensity to do that, then that second swallow will clear the foodstuff out. You could benefit from a swallow study to see where you are in this process. Question: Just to comment, I have a high gradient and I had a reflux one night and I couldn’t breathe. It blocked out my air passage and everything and I felt like I was just going to suffocate. Since then I’ve taken two bricks, put them underneath the head of my bed and that has helped. Plus I take Zantac at bedtime. Answer: Exactly. H2 blockers raise the pH. Remember the acidity, or relative acidity, and what happens is you can reflux, or acid reflux, you’ll know it. Good point. Anybody else? Question: In myotonic muscular dystrophy, what is the contraction of the time? Does that mess up the timing of the whole swallowing process? A: That is interesting. That’s a good question. We thought the tongue might be impaired, but it doesn’t seem to be impaired. It’s the muscles down in the constrictor muscles lower in the pharynx that seem to be the problem and we’re just learning something about how those muscles function, and how the myotonia works. It’s interesting. In 1968, there was a study done by doing some barium swallows, not the 16 per second studies, but four per second. And he was astute enough to realize, “You know, the hyoid moves up at a certain time and the hyoid relaxes as the swallow continues. You know, it looks like in those three patients that the hyoid stays up, it doesn’t relax. Just like in myotonic dystrophy, the muscles don’t relax. When we did the study on the timing, the initial movement of the hyoid is longer. Tape break. Q: I have it almost two years. The pharmacist told me about a medication that cost just a few dollars. It changed everything now, I can breathe better, eat better, everything is better. And I am not choking. A: What it is is excess saliva that produced by salivary glands. They use acetylcholine as a transmitting agent transmitting agent. If you get a medicine which is anti-cholinergic, and many of the cough medicines are that try to cut secretions that may be a benefit and I think that’s what you’ve got. The disadvantage is in some people, using anti-cholinergic is excessively dry mouth and have real bit of difficulty. There are also medications which liquefy or make the mucous less sticky. And which will allow normal cleansing operations to clear that up, if the mucus is very thick. Q: We have a problem in mucus becomes very thick, and having heart condition seems to limit the choice in medications that can be used to deal with the mucus problems. This leaves me with subtle little problems like this like not being to handle large pills. I used to be able to handle 500mg like that, which was a regular part of my diet. But after several rounds of these allergy attacks lately, I can no longer take these large pills. Is there a way around it? A: Well, there are robitussin, not with the stuff that has codeine or a narcotic, are supposed to loosen up, make more liquid those thick (I don’t know when you’ve had this). You have to be careful not to take anything that makes it more liquid, or something that may give you cardiac disrhythmia. Q: Hi, I have a daughter who has myotonic dystrophy. She’s got a gastrostomy button and when we give her stuff like codeine, she’ll hold it in the front of her mouth. And she has had aspiration pneumonia from applesauce. Can you tell me why she holds it in her mouth, or what I need to do to find out why. Johnson: She won’t initiate swallowing? Q: No, she won’t initiate swallow or try to swallow or anything. She’ll just hold it in her mouth and it eventually drools out. Johnson: It could be weakness in the pharyngeal muscle. If she subjectively kind of feels she has trouble swallowing. I don’t know. You have to do a swallow study to know where the problem is. It could be that she knows she’s having trouble and at some level of functioning and consciousness, “No, I’m not going to do that.” I’m not sure why she would point to. We could do the swallow study with very small amounts of material, 1 cc. 1 cc of barium gives us the information. How old is she? Johnson: That’s no problem. I think the youngest we’ve done is 2 months. Any other questions? You’ve been a great audience. Thank you very much. Testimony began Wednesday in a wrongful death suit in which a family from Dallas County is seeking $4 million in damages from a local hospital. The suit in the 350th District Court claims that Hendrick Medical Center, Radiology Consultants of Abilene and a group of six physicians failed to properly diagnose and treat Janie R. Lowery, and administered a test that they say led to the 53-year-old woman’s death. During opening arguments Wednesday, attorneys representing Hendrick and the six physicians rebutted the allegations, saying the highest standards of care were followed during Lowery’s evaluation and treatment at Hendrick. Lowery was admitted to Hendrick Medical Center in January 1996 with complaints of muscular weakness and weight loss, said Alicia Slaughter, an attorney representing Lowery’s husband and three children. The three Lowery children are incapacitated by myotonic muscular dystrophy, an inherited form of the degenerative disease, which produces both muscular weakness and severe, uncontrollable spasms. It can also lead to mental retardation. Slaughter told the jury Dr. Joseph M. Ferguson had referred Lowery to two other Hendrick doctors for testing. Because of the family history of myotonic muscular dystrophy, Ferguson sent Lowery to neurologist Dr. Russell Dickerson to see if that form of muscular dystrophy could be contributing to her muscular weakness, Slaughter said. Prosecutors argued that Ferguson failed to properly test Lowery’s ability to swallow, a charge that attorneys for the doctor deny. Lowery also suffered from a condition called celiac sprue, an inherited intolerance to foods containing gluten, a protein found in some foods, Slaughter said. To determine if that condition could be causing some of her weakness, Lowery was referred to Dr. William Haynes, a gastrointestinal specialist. Haynes ordered an upper gastrointestinal examination that requires the patient to drink a radioactive barium solution. When the barium was administered, Lowery inhaled the solution, drawing it into her lungs instead of drinking it, Slaughter said. Despite being placed on oxygen and having respiratory therapy prescribed, Lowery developed a fever the next day. She died Jan. 29. Slaughter said she expects the testimony of expert witnesses to show that the doctors involved in Lowery’s care failed to properly check her ability to swallow, and administered the barium solution in an unsafe manner. Attorneys representing Hendrick and the physicians involved in the suit countered Slaughter’s remarks, saying the three physicians — who between them have 65 years of education and practical experience — conducted tests on Lowery and felt she was able to perform the barium examination. They also noted that, after the test in which she inhaled the barium solution, she was placed on oxygen and showed marked improvement immediately following the incident. Lowery was able to eat ice cream and swallow medication after inhaling the solution, said attorney Robert Wagstaff, representing the physicians. He said Dr. Ferguson had spoken with Lowery about her difficulty in swallowing during her first visit to his office. “She said it was no problem,” Wagstaff said. He also said the defense would produce witnesses to testify that barium is an inert material, with a “one-in-500,000 chance” of causing complications. The odds of barium leading to death are one in 2 million, he said. He also impressed upon the jury that the expert witnesses Lowery’s attorney would be introducing had never examined Mrs. Lowery, and based their opinion solely on having read the medical files. Testimony is expected to continue through next week. Contact courts writer Jason Gibbs at 676-6734 or gibbsj@abinews.com. Members: Log in to customize this site and create your own Web site! Stroke is the leading cause of oropharyngeal dysphagia. FIGURE 1A. The tongue initially forms the food bolus (green) with compression against the hard palate. FIGURE 1B. Displacement of the food bolus into the pharynx by the tongue initiates deglutition. FIGURE 1C. Relaxation of the cricopharyngeal muscle (the physiological upper esophageal sphincter) permits movement of the food bolus into the proximal esophagus. Esophageal dysphagia is caused by disordered peristaltic motility or conditions that obstruct the flow of a food bolus through the esophagus into the stomach. Achalasia and scleroderma are the leading motility disorders, while carcinomas, strictures and Schatzki’s rings are the most common obstructive lesions. Patients with dysphagia usually present with choking or coughing and report an abnormal sensation of food sticking to the back of the throat or upper chest when they are trying to swallow. A patient’s general health information should be reviewed, including long-term illnesses, current prescription medications, and alcohol and tobacco use. While the literature does not describe dysphagia caused by nonprescription drugs, it is always reasonable to inquire about this. Commonly prescribed medications can cause dysphagia in either the oropharyngeal or esophageal stages of swallowing (Table 3).10,11 Antibiotics (doxycycline [Vibramycin], tetracycline, clindamycin [Cleocin], trimethoprim-sulfamethoxazole [Bactrim, Septra]) and nonsteroidal anti-inflammatory drugs are the most common causes of direct mucosal injury to the esophagus, while potassium chloride tablets can cause the most severe injury. Anticholinergics, alpha adrenergic blockers, angiotensin-converting enzyme (ACE) inhibitors and many short- and long-acting antihistamines can cause xerostomia. Information from Johnson A. Deglutition. In: Scott-Brown WG, Kerr AG. Scott-Brown’s Otolaryngology. 6th ed. Boston: Butterworth-Heinemann, 1997. *–Especially the slow-release (SR) formulation. Information from Boyce HW. Drug-induced esophageal damage: diseases of medical progress. [Editorial] Gastrointest Endosc 1998;47:547-50, and Stoschus B, Allescher HD. Drug-induced dysphagia. Dysphagia 1993;8:154-9. FIGURE 2. Differentiating symptoms of dysphagia. Patients with oropharyngeal dysphagia present with difficulty in initiating swallowing and may also have associated coughing, choking or nasal regurgitation. The patient’s speech quality may have a nasal tone. These dysphagias are most often associated with stroke, Parkinson’s disease or other long-term neuromuscular disorders. Local structural lesions are less common. Obstructive pathology is typically associated with dysphagia of solid food but not liquids. Patients may be able to force food through the esophagus by performing a Valsalva maneuver, or they may regurgitate undigested food. Close questioning of the patient may reveal a change in diet to one of predominantly soft foods. Rapidly progressive dysphagia of a few months’ duration suggests esophageal carcinoma. Weight loss is more predictive of a mechanical obstructive lesion.12 Peptic stricture, carcinoma and Schatzki’s ring are the predominant obstructive lesions. A general physical examination and focused organ- or symptom-specific examinations based on the patient’s history often identify the etiology of dysphagia. Neurologic evaluation should include assessments of the patient’s mental status, motor and sensory functioning, deep tendon reflexes and cranial nerves, and a cerebellar examination. Patients with impaired cognitive functioning and those who are under sedation should be carefully assessed, because these neurologic states can interfere with swallowing. Motor and sensory examinations may reveal a new stroke or identify a long-term illness. Special attention should be focused on the cranial nerves that are associated with swallowing, particularly the motor components of cranial nerves V, VII, IX, X and XII, and sensory fibers from cranial nerves V, VII, IX and X. A decreased gag reflex is associated with an increased risk of aspiration.13 A “wet voice” may suggest long-term laryngeal aspiration, while a weak, breathy voice may indicate vocal cord pathology. Observing the patient swallowing a variety of liquids and solids can be helpful. The patient should demonstrate enough neuromuscular control to chew food, mix it into a bolus with saliva and propel it to the posterior pharynx without choking or coughing. Elevation of the larynx during the swallowing reflex protects the airway and opens the upper esophageal sphincter. Normal laryngeal ascent can be palpated by placing the index finger above the patient’s thyroid cartilage when the patient swallows. The cartilage should move cephalad against the physician’s finger. Thyroid masses and lymphadenopathy that cause obstructive dysphagia can be palpated on examination of the neck. A widened anteroposterior chest diameter and distant breath sounds are signs of chronic obstructive pulmonary disease, which could be caused by long-term aspiration. The patient’s abdomen should be examined for masses and organomegaly. The presence of occult blood in the stool may be a sign of neoplasms or esophagitis. Initial laboratory evaluations should be limited to specific studies based on the differential diagnosis generated after the completion of a history and physical examination. A complete blood count screens for infectious or inflammatory conditions. Thyroid function studies may detect hypo- or hyperthyroid-associated causes of dysphagia (e.g., Grave’s disease or thyroid carcinoma). Other studies should be based on specific clinical conditions. FIGURE 3. An algorithmic approach to the diagnostic evaluation of dysphagia. Adapted with permission from Trate DM, Parkman HP, Fisher RS. Dysphagia. Evaluation, diagnosis, and treatment. Prim Care 1996;23:417-32. Although a patient history and physical examination identify the etiology of dysphagia in most patients, further testing may be indicated to confirm the diagnosis or to establish the patient’s risk of aspiration (Figure 314 and Table 4). Subspecialists in radiology or gastroenterology will most often conduct these tests. Some centers have multidisciplinary dysphagia teams available to offer comprehensive diagnostic evaluations and therapeutic interventions. A barium study (esophagram) is often the first step in evaluating patients with dysphagia, especially if an obstructive lesion is suspected. Despite several drawbacks, esophageal pH monitoring remains the gold standard for diagnosing patients with suspected reflux disease.19 A nasogastric probe is inserted into the patient’s esophagus and records pH levels. These levels are compared with the patient’s record of symptoms over a 24-hour period to determine if acid reflux contributes to the symptoms. Combined recordings of esophageal pH levels and intraluminal esophageal pressure may aid in diagnosing patients with reflux-induced esophageal spasm. Members of various family practice departments develop articles for “Problem-Oriented Diagnosis.” This article is one in a series coordinated by the Department of Family Medicine at the Uniformed Services University of the Health Sciences, Bethesda, Md. Guest editors of the series are Francis G. O’Connor, LTC, MC, USA, and Jeannette E. South-Paul, COL, MC, USA. is currently director of residency training at the Naval Hospital, Jacksonville, Fla., and is an assistant professor at the Uniformed Services University of the Health Sciences F. Edward Hébert School of Medicine, Bethesda, Md. He earned his medical degree at the Oregon Health Sciences University School of Medicine, Portland, and completed a family practice residency at the Naval Hospital, Camp Pendleton, Calif.
Lindgren S, Janzon L. Prevalence of swallowing complaints and clinical findings among 50-79-year-old men and women in an urban population. Dysphagia 1991;6:187-92. Tibbling L, Gustafsson B. Dysphagia and its consequences in the elderly. Dysphagia 1991;6:200-2. Brin MF, Younger D. Neurologic disorders and aspiration. Otolaryngol Clin North Am 1988;21:691-9. Layne KA, Losinski DS, Zenner PM, Ament JA. Using the Fleming index of dysphagia to establish prevalence. Dysphagia 1989;4:39-42. Nelson C, Woodwell D. National Ambulatory Medical Care Survey: 1993 summary. Vital Health Stat 13 1998:iii-vi,1-99. Schuller DE, Schleuning AJ, DeWeese DD, Saunders WH. DeWeese and Saunders’ Otolaryngology–head and neck surgery. 8th ed. Schuller DE, Schleuning AJ, eds. St. Louis: Mosby, 1994. Logemann JA. Evaluation and treatment of swallowing disorders. San Diego: College-Hill, 1983. Castell DO. Approach to the patient with dysphagia. In: Yamada T, ed. Textbook of gastroenterology. 2d ed. Philadelphia: Lippincott Williams & Wilkins, 1995. Johnson A. Deglutition. In: Scott-Brown WG, Kerr AG. Scott-Brown’s Otolaryngology. 6th ed. Boston: Butterworth-Heinemann, 1997. Boyce HW. Drug-induced esophageal damage: diseases of medical progress. [Editorial] Gastrointest Endosc 1998;47:547-50. Stoschus B, Allescher HD. Drug-induced dysphagia. Dysphagia 1993;8:154-9. Kim CH, Weaver AL, Hsu JJ, Rainwater L, Zinsmeister AR. Discriminate value of esophageal symptoms: a study of the initial clinical findings in 499 patients with dysphagia of various causes. Mayo Clin Proc 1993;68:948-54. Horner J, Massey EW. Silent aspiration following stroke. Neurology 1988;38:317-9. Trate DM, Parkman HP, Fisher RS. Dysphagia. Evaluation, diagnosis, and treatment. Prim Care 1996; 23:417-32.
Cooper GS. Indications and contraindications for upper gastrointestinal endoscopy. Gastrointest Endosc Clin N Am 1994;4:439-54. Dooley CP, Larson AW, Stace NH, Renner IG, Valenzuela JE, Eliasoph J, et al. Double-contrast barium meal and upper gastrointestinal endoscopy. A comparative study. Ann Intern Med 1984;101:538-45. Castell JA, Stumacher SG, Castell DO. Approach to patients with oropharyngeal dysphagia. Gastroenterologist 1994;2:14-9. Feussner H, Kauer W, Siewert JR. The place of esophageal manometry in the diagnosis of dysphagia. Dysphagia 1993;8:98-104. Bollschweiler E, Feussner H, Holscher AH, Siewert JR. pH monitoring: the gold standard in detection of gastrointestinal reflux disease? Dysphagia 1993; 8:118-21. A myotonic dystrophy patient with swallowing problems is using this process and the swallowing has improved. Don’t forget to sign the GUESTBOOK! (Note lots of info here so it may take a minute to open) Also donations to keep us operating are appreciated. Please sign up for the mailing list below. This page is intended for educational purposes only, to provide an overview of Myotonic Dystrophy for patients, their families, and health care providers. It is not intended to recommend any specific treatment, nor should it be used as a guide for self-treatment. Patients with Myotonic Dystrophy should consult their physician or heatlh care provider before making any changes to their treatment regimen. Send mail to info@myotonicdsytrophy.org with questions or comments about this web site.